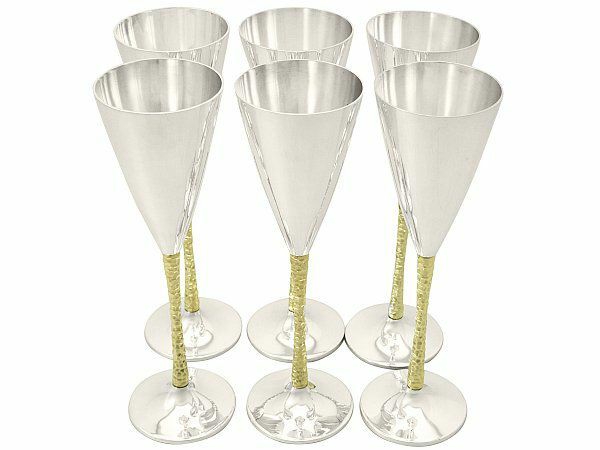 These impressive vintage sterling silver champagne flutes have a plain conical flute shaped form onto a pedestal and plain circular spreading foot. 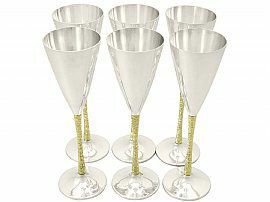 The surface of each champagne flute is plain and unembellished. The tapering textured finished pedestals are embellished with parcel gilt decoration. These vintage champagne flutes were crafted by and reflect the iconic style of the renowned London silversmith Stuart Devlin. This set of vintage champagne flutes is a very good gauge of silver, fine quality and in excellent presentation condition. Full hallmarks struck to the underside of each champagne flute are all very clear.